Welcome to the official sign up for the Spring into Horror Readathon! 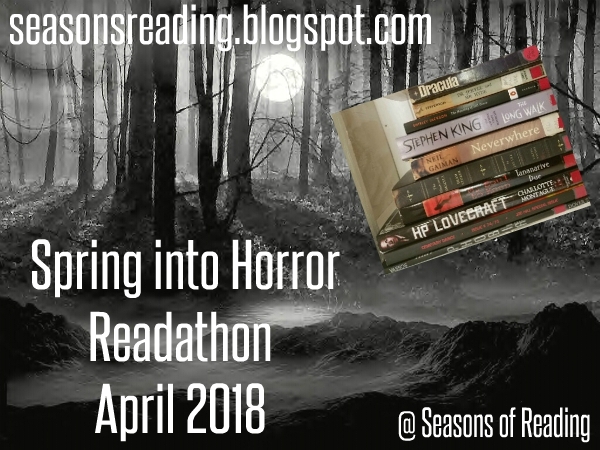 All our regular seasonal readathons are now a month long so Spring into Horror runs for the entire month of April. A month of horror...I'm so in! We start at 12:00 am on April 1 and end at 11:59 pm on April 30. Times are set for the central time zone so adjust your times accordingly (you can use the link to the time zone converter in the sidebar menu). You DO NOT have to participate the entire month. Join in when you can, start in the middle, end early...whatever works best for your schedule. 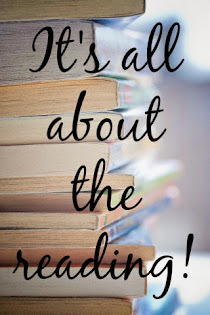 As with all of my readathons, it will be an event of relaxed reading during which we can personally challenge ourselves and whittle away those ever looming TBR piles/shelves/libraries. Also, Dewey's 24 Hour readathon will fall on one of the weekends so that will be a fun addition to our month of reading bliss. Guidelines for the readathon can be found HERE or you can access in the sidebar menu. Any information you need about the readathon can be found there. Please do be sure to check the guidelines to make sure you're following along correctly. There are specific rules regarding signing up and wrapping up, especially in regards to the giveaway. Also, regarding the giveaway, I'll be again adding a Google form to capture names and email addresses so if you're interested in winning a prize (and you've met the sign up and wrap up criteria), I will ask you to fill in that form which will be located on the prize page. The form will now have a required field for you to enter the link to your wrap-up post. Our hashtag for social media is #SpringHorror Also, don't forget about our Facebook group. You can also access via the link in the sidebar menu. I can't wait! I've been slowly accumulating books for months! Woot! Another one! Can't wait! here's the book to read, 'Refuge' by Regina Jackson Stinnett. I am excited to get through some of the books on my TBR list, mostly horror :) Thank you for hosting!